Did you know that on this day in 1933, the first drive-in movie theater opened in Camden, New Jersey? Chances are you have seen these theaters in old movies and photos, but you have probably never been to one! These outdoor cinemas are from a bygone era in America but still remain iconic to this day. Richard Hollingshead invented the drive-in theater in 1932. At the time, Hollingshead was working at his father's company, Whiz Auto Products, and wanted to find a way to merge his two interests: cars and movies. Allegedly, the idea for this theater also came from the fact that Hollingshead's mother was too large for typical movie theater seats, and he wanted to create a means for her to watch films comfortably. Whatever the ultimate motive was, he decided to nail two sheets to a tree in his backyard and mount a projector on the hood of his car. He tested for a variety of weather conditions, sound levels and spacing of vehicles to provide the best moviegoer experience. Once he finalized his creation, Hollingshead applied for a patent that he then received on May 16, 1933. On June 6th, 1933 Hollingshead founded Park-in Theaters and opened the first drive-in on Crescent Boulevard in Camden, New Jersey. At that time, admission to a movie was 25 cents per car and 25 cents per person. While this particular theater only operated for three years, the drive-in idea caught on and 17 other theaters opened across the U.S. during the 1930s. In the 1940s, the drive-in's popularity grew and new technologies helped to provide better quality sound and pictures. One of the most important developments was that of in-car speakers invented in 1941 by RCA, which allowed individuals to adjust their own sound and decreased noise pollution during shows. 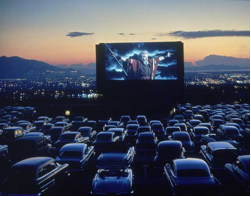 Eventually in the 1980s, drive-in theaters developed the ability to transmit the sound through AM and FM radio so that spectators could simply tune their car radios to a specific station and listen through the car's sound system. Drive-in movie theaters became most popular after World War II and into the 1950s. By 1958, there were over 4,000 drive-ins across the U.S. There were many appeals to the drive-in. On one hand, they were advertised as a family friendly activity. Parents could bring their children and let them sleep in the backseat while they enjoyed a quiet night at the movies, no babysitter needed! Many theaters catered to this idea by adding playgrounds or amusement rides on the grounds. On the other hand, drive-ins gained popularity among teenagers and young people who saw them as a chance to be alone with a significant other without parental supervision. Having a date night at the drive-in became a staple for young Americans of the baby boomer generation. Drive-ins peaked in the 1950s and 1960s, but by the 1970s they started to fade away. Many factors contributed to their decline, such as the rise of multiplexes and the better movie quality and variety they offered. However, one of the biggest factors contributing to drive-ins waning was the price of land in growing suburban areas. With the spread of suburbs, wide-open areas of land that previously held drive-ins became ideal real estate for shopping centers and housing. Since most drive-ins were family businesses, many owners were forced to sell the land since theaters were no longer profitable. Only around 400 drive-ins remain in operation in the U.S. today. In the 2000s, there was a brief revival of drive-ins driven by baby boomers who wanted to bring back the beloved theaters of their youth. According to the National Association of Theater Owners, more than 75% of current drive-ins are privately owned small businesses.